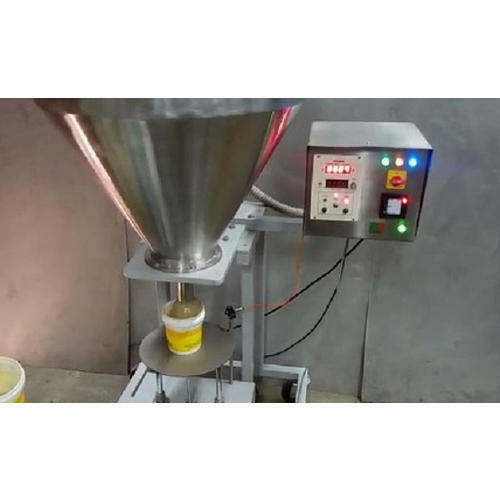 Electro Pneumatically operated Tin Lifting arrangement is provided to remove human error during grease filling operation. The grease being lighter materialneeds to be pressure filled in the container. A manual operation of holding the tin below nozzle and lowering it during filling cycle is eliminated to obtain accuracy. Augor Driver Motor 1 H.P., 3 Phase, 415 V A.C.
range 200 g to 1000g. We offer highest quality of Automatic and Semiautomatic Liquid Filling Machine, Powder Filling Machine, Paint Filling Machine, Lid Pressing Machines, Sachet Machine, PET Blow Molding Machine etc. K & R International has been established since 1995, offering top quality Automatic and Semi Automatic Filling and Packaging machines and Packaging solutions for various industries like Food, Beverage, Water, Dairy, Oil, Agro, Pharmaceutical, Chemical, Paint, Cosmetics, and others Industries. Machines offered by us are used to pack foods like Spices, Tea, Rice, Condiments, Coffee, Sugar, Flour, Curry Powder, Snack Foods, Pasta, Dry Fruits, Grains, Nuts, Sauces, Juices, Water, and also for Detergents, Shampoo, Syrups, Tooth Paste, Hair Dyes, Gels, Pastes, Paint, Seeds, Fertlizers, Pesticides etc almost anything. Specializing in Powder Filling Machines, Liquid Filling Machines, Sachet Packing Machines also known as FFS Machines or Pouch Packing Machines and Bagging machines for 25 kg. 50 kg. and Jumbo bags, our range comprises of Fully Automatic Machines with advanced technology using Servo motors, Motion control systems, PLC and Touch Screens for high productivity to Semi automatic filling, sealing and capping machines for start-up operations. The machines are accurate, efficient, sturdy, durable, reliable, cost effective and require very low maintenance. We believe, machines must perform efficiently as no manufacturing unit can afford needless down time. Machines exported to USA, South America, Africa, Middle East, Europe and other regions.